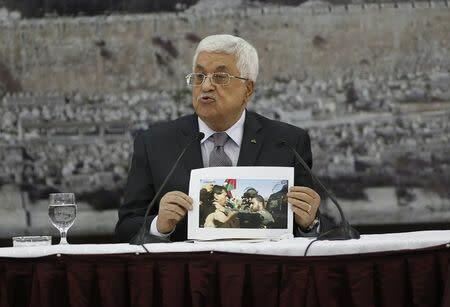 RAMALLAH, West Bank (Reuters) - Palestinian President Mahmoud Abbas said on Sunday he was discussing with Jordan plans to resubmit to the United Nations Security Council a resolution calling for the establishment of a Palestinian state that failed to win enough votes last week. Jordan remains a member of the Security Council while several other countries with revolving membership were replaced over the New Year. The Palestinians hope these states will be more sympathetic to their resolution demanding an Israeli withdrawal from occupied territories and independence by 2017, although the veto-wielding United States would be all but certain to vote 'No' again, as it did on Dec. 30. "We didn't fail, the U.N. Security Council failed us. We'll go again to the Security Council, why not? Perhaps after a week," Abbas told officials at a cultural conference in the West Bank city of Ramallah, the Palestinian seat of self-rule government. In the U.N. vote on Tuesday, the Palestinian draft received eight votes in favor, including France, Russia and China, two against and five abstentions, among them Britain. Australia joined the United States in voting against the measure. But any resubmission would face almost certain failure. The U.S. has veto power as one of the council's five permanent members and has pledged to block Abbas's plan, calling it one-sided and unproductive. In retaliation for the move to the ICC, Israel announced on Saturday that it would withhold 500 million shekels ($125 million) in monthly tax funds that it collects on the Palestinians' behalf, in a blow to Abbas's cash-strapped government.